James Oliver Cromwell (1940 – vivente), attore statunitense. Babe mi ha anche ispirato a diventare vegano. Dopo aver lavorato tutta la mattina con questi straordinari animali, vedevo i loro congiunti sulla tavola da pranzo. Avevano prosciutto e anatra, ogni animale tranne il cavallo. È stato allora che ho detto: "Devo provare ad essere vegano". E per la gran parte, dal 1994 sono stato vegano. [«Prima di Babe eri vegetariano. Cosa ti spinse a quel cambiamento?»] Nel 1975 ho attraversato il Paese in motocicletta. Ricordo che era il periodo più brutto dell'anno, con un freddo tremendo. Andando lungo il Texas, passai attraverso gli allevamenti, che non avevo mai visto prima. Fu uno spettacolo davvero illuminante, straziante e terribile. È un sistema corporativo del tutto estraneo a ciò che è sostenibile, a ciò che è umano, a ciò che è compassionevole. A quel tempo, non sapevo nemmeno cosa fosse un vegetariano. Ho solo pensato: "Non posso più mangiare gli animali". [Babe] also inspired me to become vegan. After having worked all morning with these extraordinary animals, I'd see their relatives on the lunch table. They had ham and duck, every animal except horse. That's when I said, "I've got to try to be a vegan." And for the most part, I have been vegan since 1994. [«You were vegetarian before Babe. What inspired that change?»] I rode across the country on a motorcycle in 1975. I remember it was the worst time of year and bloody cold. When I was going through Texas, I went through the feedlots, which I had never seen before. It was a very sobering sight—heartbreaking and awful. It's a corporate system completely out of touch with what is sustainable, what is humane, what is compassionate. At the time, I didn't even know what a vegetarian was. I just thought, "I can't eat [animals] anymore." Fare il film Babe mi ha aperto gli occhi sull'intelligenza e la personalità indagatrice dei maiali. Questi animali altamente sociali hanno una straordinaria capacità di amare, gioire e soffrire, che li rende notevolmente simili ai nostri cari amici canini e felini. 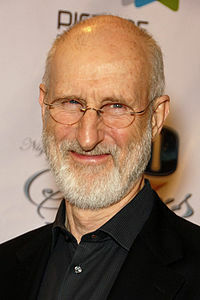 ↑ (EN) Dall'intervista della Humane Society of the United States, The Tale of an Unprejudiced Heart: An Interview with James Cromwell, humanesociety.org, 17 dicembre 2014. ↑ (EN) Da un comunicato stampa per la campagna animalista SaveBabe; citato in James Cromwell: King Lear, Babe and the Black Panthers, nouse.co.uk, 26 ottobre 2007.